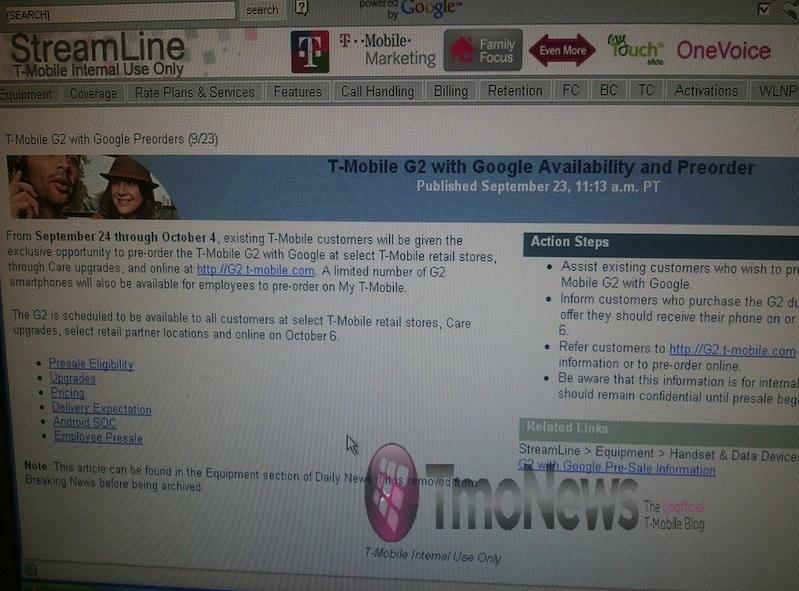 You are here: Home > T-Mobile G2 Pre-Order Is A Go For Tomorrow, Release October 6th! We’ll just make this a super quick post but the T-Mobile G2 with Google will be available for pre-order starting tonight and running through October 4th with a release date on October 6th. I can’t say how happy I am that the October 16th delayed release info was wrong, but I love it when information like that is wrong in the favor of an earlier date! Get your credit cards ready! ← LG Optimus Reveals Itself, Wi-Fi Calling On Board? YAY!!!!!!!!! im getting one for sure!!!!! No the N1 is not lol what device would it be keeping up with? it has to have 2.2 to “keep up” with a 2.1 Vibrant. Chill out 2FR35H you’re starting to sound like a douche. Great, I’ll put my money down tonight. Goodbye Vibrant. Your getting rid of your vibrant! why for a g2? If your interested in selling it let me know! amirnaqui@gmail.com. I am hesistant to buy this cheaper at someplace other than TMOBILE. The termination fees at these cheaper options can be quite high I am told. WooHoo!!! I’m checking first thing in the morning tomorrow and getting ours pre-ordered! So happy this is after payday! Best news all day! Time to sell a kidney! Lmao. How much for the kidney? I’ll keep one extra just in case. PLEASE: Someone explain to me the pre-order process? Do I pay for it when I preorder or what exactly? I know, stupid question but I’ve never preordered before and I would like to know. Thanks! I AGREED WITH YOU I ALSO NEED TO KNOW MORE. I NEVER PRE-ORDER A PHONE BEFORE. I ASKED THE SAME THING IN THE LAST g2 POST. AND THEY deleted my comment!!!!!!!! IM A BIG TMONEWS FAN AND THATS WHAT I GET? Basically you just pay for the phone in full, whether you renew your contract and pay the upgrade price, or buy out right for retail price. Then once the phone releases which is Oct. 6 you will receive it in the mail that day or go to the retail store to pick it up. With the MyTouch 3G you had to preorder online and you received the phone a week or so earlier than when you could buy it in stores. It was nice because you got the device early even before stores carried it. With the G2 it releases the same date for everyone so you may want to preorder so it doesn’t sell out on you. Hmmmm, nice! But I’ll wait till Wal-Mart or Costco has it since their G2’s will probably be 150, rather than 200 through T-Mobile. Just talked to T-Mo. Price is $199.99 and $50 MIR. So it will be the same as Costco, though you’ll have to wait a few weeks for some of your money. Pre orders also don’t require you to pay when you order, so you can (sort of) do short term payments. I started making some extra payments to my account a couple weeks ago so I have a balance of ($120.00). The final $80 will be due at my next billing cycle so Ill pay a little extra at my bill at the end of the month, an the rest with Octobers bill. I Hope I Can Pre Order, Regardless Of My By-The-Month Status. I Remember I Couldn’t Pre Orde The Sidekick LX 2009, Because Of This. Lol, there goes part of my paycheck. Screw it, its well worth it I have been waiting for this phone since the G1 came out. Well, I won’t be pre-ordering it. I’m not sure if I want to extend my contract with TMO, honestly. I’ll wait till the price drops, and I want to wait til December and see what all other phones will be coming out, probably a few with better specks. And Best Buy, RadioShack, etc will have it cheaper, in a month, hahaha. Now, if I can get 1 for free, because of the Cliq, then ok.
It’s a 10% discount. Ever heard of a little thing called tax? You meant to say that you were “Happy” the Oct 16 release date from wrong right? anywho it happens to everyone, but im real happy you guys got this information, this is why i visit this site every morning before anything else. Got it, thanks for pointing that out, was kind of in a hurry to post! Gotta make sure you guys this stuff quick! No problem at all, you guys are good at releasing information, especially this, i did not see the news anywhere else when you released it, so i hope all those tmonews haters eat their words. P.S. cant wait to change my name since i wont be a G1 user anymore, any recommendations out there? “Former G1 user who waited for G2”? “G2 user waiting on G3”? Sell me your HD2 instead. I was actually about to get an HD2 as an early upgrade anyway, then throw one of the many Linux builds on it. Cool I’m putting my N1 on ebay. Was this an email T-Mo sent out to let all that registered “be the first to know?” I didn’t get one. Also, does that mean its available to pre-order through the website at midnight? My G1 has got to go, the thing has been dropped SO many times. Might want to pre-order a case for your G2 then! Guess typing and playing Halo result in typos. Just got off the phone with T-Mo. Pre-order website goes live tonight at 21:30 Pacific time. The G2 will ship and be in your hands before October 6. Only problem is that any phone ordered on the website must be returned to T-Mo directly not back to a corporate store. Corporate stores will have them on October 6. Local stores will be taking names tomorrow. No warranty as to accuracy of this info, but this is what I was told. no problemo here, nearest t-mo store is 75 miles away. having been getting devices through the mail for years. Any word from Radio Shack about preorders there or whether they’ll have the phone on 10/6? I’m just going to wait til the end of the year. Great news! I’ll be pre-ordering mine first thing tomorrow morning. I’m not a Tmobile customer yet but I was planning on switching for the G2. Would I be able to buy an even more plus plan tomorrow and be able to pre order or would I have to be a customer before then? now i gotta wait till ocotber 6th to get it in stores..gonna have my friend reserve me one! This is good news at any rate, though my dilema only begins. Radio Shack promised a $150 G2, Best Buy price matches and somebody commented on an earlier Tmonews story that they received a $50 Off Any Phone coupon in the mail from T-Mobile. After going through the other comments, I find that $50 is the least of my worries. If I’m going to buy this directly from T-Mobile as an upgrade to my G1 contract, I may as well preorder anyway. This is good news, especially about it coming out the 6th. That’s really not too far away, 2 weeks I believe. I’m actually eligible for a full upgrade now. Yesterday I checked and the vibrant was 329 for an extension now it’s 199. Yay for me, great timing tmo. I like how I signed up for the updates on their website and I haven’t gotten Jack Schmidt about it. You haven’t recieved an update because if you look closely the picture is a screen shot from StreamLine (a T-Mobile internal notification system). It did NOT come from a customer’s home computer. We might get the e-mail at midnight. I’ll be expecting something tomorrow. I’m thinking it will be $199 after a $50 rebate. no i just dont want it to urn out like the G1 and only get one update. and i also dont want to get this phone and something way better comes out in a month or two. Looking forward to tomorrow then..
I’m surprised anyone fell for the 16th release date as it is a Saturday. I think a 1 got added to the 6 and it created confusion. Yes, finally a release date. I’m glad its not getting delayed. So is there any way to verify that if it goes on sale at 12AM or midnight what time zone that begins in? Is that 12 midnight Eastern / 9 PM Pacific? I posted info from T-Mo about 30 minutes ago regarding the pre-order. I no longer see my post. 2) How do I BOGO if pre-ordering? On a side note. Just to give everyone a heads up. I called a local Radio Shack and the guy I talked to seemed decently knowledgeable on what they are doing for pre-orders. He said it wasn’t confirmed 100% that they will be selling them for $149, but he did say he was given a confirmed release date of the 13th. Either way I will certainly be pre-ordering with T-Mobile directly. I trust their customer service more than most places and would much rather deal with them than Best Buy or Radio Shack. Through personal and work experience, direct is always better than with a dealer. Sorry, no way to edit my posts. Just spoke to my local corporate store. I was told that there is no pre-order from the stores. Only pre-order is online. Some stores are not even taking names and will only do a first come first served sale on October 6. I’m thinking they haven’t read their email. When I called my local corp store and asked about the pre-order, the manager said “Hold on a second, I think I have an email about the G2.” He then proceeded to read to me, verbatim, what the screen shot shows – it was literally the first he’d heard of it. Customer care also confirmed it (I’m nothing if not obsessive and thorough ) and said they’ve only known about for a couple of hours. Fwiw, customer care didn’t have an exact time the pre-orders would start, but guessed it would probably be 12 am PST (3 am EST). Nice. I’ll be placing my order tomorrow. Time to put my G1 away as the “back-up” cell. It served me well. I don’t think I’ll buy this any place other than TMO. The early termination fees you can incur by going through a dealer are quite high in some instances. It’s also a business expense for me so I can write it off. I’m just thinking of the long term cost potential vs saving a few bucks up front. I guess the thing to do is read the fine print and ask questions before you go for the great discount. My biggest concern with getting it from a third party is if they’ll screw something up with the contract like putting me on a new, more expensive plan while telling me I’m just upgrading… I’ve heard of worse things happening. Any idea on a buy 1 get 1 free plan for the g2 release? Earlier rumors claimed similar. Wow, I can’t wait to run out and not get it! So what do y’all think is better. To preorder online and have it shipped or to pick it up in store? I will never pick up another phone from a T-Mobile store. Seems that every device I’ve gotten from the store goes bad. Never had a device go bad that I ordered from CC but to each his own. I just came from the tmo store by my house in New Haven,ct. I ask about the g2 pre-order he told yeah it’t tomorrow and you can also get the vibrant as a bogo deal. the g2 won’t be bogo until December. bu bye Vibrant, POS. Hello stock Android G2….so damn happy!! Other than the gps issue? -Um, 2.2 update…….September……October?…….November?…… Next year?….. Whenever everyone else gets 3.0?………..
I’m not giving mine up, just sayin’ there’s a few issues that would cause people to want to look to the new hotness. Yo, this might not seem true, but I just found out that my parents have pre-ordered the G2 a few days ago from T-Mobile. I was skeptical at first, but it turns out that they have called the “head office” of T-Mobile, and through lots of talk that only parents could do, got them to “pre-order” it for us. hahaha, your a douche. No need to say “I call bs” but made me laugh none the less. This person wanted to share a moment in there life with complete strangers and you completely crapped on him……but still made me laugh. Remember, if you order from Best Buy, or any other Authorized dealer, and bypass T-Mobile, but decide to cancel your extended 2 year contracts, you will be paying an ETF to T-Mobile, “AND” to the Authorized dealer. Ex) You owe T-Mobile an ETF, and Best Buy an ETF. Because when you sign up with an authorized dealer aka Third-party dealer, you owe them money too, since they won’t be getting paid from T-Mobile for signing you. You talk as if there is a BOGO deal for the G2. Has something leaked that I didn’t see? I asked a rep last week. Basically the G2 cant be the free phone. So you could get a G2 and a Vibrant or whatever else. I want one, but I’ll give it about a month before I buy. First, wait to see if there are any bugs, a la Vibrant gps, and B). lately TMo drops the price by $50 about a month after a release. By the way, those of you who diss T-Mobile for it’s slow rollout of “4G” and also think that Verizon is the greatest carrier since… well… the cell phone, read this. NEW YORK — Comments from Verizon Communications Inc. CEO Ivan Seidenberg on Thursday left little room for the possibility of a Verizon version of the iPhone any time soon. Speaking to investors at a Goldman Sachs conference, Seidenberg said nothing about an iPhone for the company’s current network, but said he hopes Apple Inc. will come around and allow Verizon to sell the phone for a new network it is building. The “4G” network hasn’t yet opened for service and won’t be complete next year. Reports regularly surface of an upcoming iPhone version for Verizon’s network, but so far AT&T Inc. has kept its exclusive right to sell the phone in the U.S. Verizon Wireless, meanwhile, has been promoting phones from Motorola Inc. and HTC Corp. that run Google Inc.’s Android software as an alternative to the iPhone. “We don’t feel like we have an iPhone deficit. We would love to carry it when we get there, but we have to earn it,” Seidenberg said. Verizon Wireless expects to fire up a network based on a “fourth-generation” wireless technology known as Long Term Evolution in 25 to 30 cities by the end of the year. It should have near-nationwide coverage BY THE END OF 2012, Seidenberg said. The network should allow for higher data speeds, BUT WON’T BE READY FOR PHONE CALLS This year, Verizon expects to sell data modems for the network, with phones coming next year. The first phones will probably use Verizon’s older “3G” network for phone calls, since calling over 4G hasn’t been standardized yet. That complicates the design of phones for the system. Seidenberg confirmed that he expects to leave the CEO job no later than the end of next year, to be succeeded by newly appointed chief operating officer Lowell McAdam, who was head of Verizon Wireless. Verizon Wireless is a joint venture of New York-based Verizon Communications and Vodafone Group PLC of Britain. It is the country’s largest cell phone company, with 92.1 million subscribers. AT&T is close behind. I for one would be happy to see the iPhone coming to T-Mobile since we’re both on almost idenical networks. This would make a T-Mobile design a whole lot easier for Apple. Not to mention the Softwar issues as well, just some minor shell overlay of the iOS with T-Mobile’s software and you’ll have an iPhone ready for sell in as little as Q1/Q2. Hummm maybe this is project Emerald, to make the other carriers green with envy? Project Emerald is the Mytouch HD. I don’t want to be rude but what’s so special about the iPhone? Just has better apps than Android but I do have to that it has one of the best build qualities. Yeah, its comments like these that pretty much assure that VZW will NEVER get the iphone. VZW has snubbed Apple before, and we all are aware of the size of the ego on Jobs. Wait until you see HSPA+ work exactly where you need it. I tried my Rocket in Reston, Virginia 20191, but I had no HSPA+ service even after trying for multiple days. which says Reston VA is one of the “Cities with HSPA+ Coverage”. No T-mobile representative was able to tell me where the nearest tower was that supported HSPA+. I did get some service while being close to DC, so I know the device is ok. My conclusion is that T-Mobile intends to roll out to these cities but has not actually done so. So I would caution anyone thinking about buying the new G2 expecting HSPA+ service until they had actually seen the service in operation in their area. It might take months or perhaps a year before it actually arrives. It is a shame, because I’m happy with T-Mobile for my prepaid voice plan. I would be happy to hear from anyone who does get HSPA+ in Northern Virginia. Sweet!!! Stock Android can’t be beat! so glad that this has 2.2 already, with all those cool new features!!! i bet the download speeds will be 2x faster than the Vibrant or any other non HSPA+ phone!!!! Ok I’m loving this phone but I really wanna see a video on this thing, t-mobile is really keeping this phone tight until release. Can anyone please get a hands on video of this.Also, Dave any info on Mytouch slide Android 2.2? I don’t believe the T-Mobile G2 has been shown off specifically, but you can search Youtube for the “Desire-Z” which is the exact same phone for Europe. The big difference is that the Desire Z runs HTC Sense while the G2 runs stock Android. I’ll wait til around Christmas to cop. Though I want it right now, I’m not gon be suckered in like I did w/ the TP2 on release day. I just talked to Customer Care, and they said it will go on pre-sale 12:30am Pacific Time on the G2 website, and if you wanted to call in to order over the phone you would have to wait till 3am Pacific/6am Eastern. Anyone else hear this? I just hope ordering for presale through presale works seamlessly with my EMP account and using my EIP to pay for it. I work for T-mobile Customer Care — Just like the G1 We will not be able to do the Pre-orders from our end please do not call us asking us to do this as we will direct you to the website. Secondly. EIP will not be available for the preorder you will not be required to pay for the phone however until the bill comes in from after it ships. So has anyone found out if the G2 will have Kineto Smart Wireless installed? dude you can download it. Yes I would like to know where you can download it as well. I thought it was only available as a pre-installed application. Anyway the phone looks amazing as seen in the videos. Very solid. The z hinge looks solid and smooth as well.. The confirmed LED notification light in the ear piece made me happy, as it was very useful to me on the G1..
Oh! And picturing it running stock android with different live wallpapers etc , makes me look forward to customizing/dressing it up! Last thing, I was actually thinking about getting a blackberry bold 9700… Lol because I need a new phone asap.. And the keyboard looks nice as does the phone itself… But looking at the youtube HTC desire z videos… Naw… Going blackberry I’d be gimping myself.. Personally. G2 with a nice spacious keyboard, stock android, 720p recording, HSPA+ Internet speeds, full touch screen plus optical track pad etc I mean cmon …. It’s worth the wait..
Has anyone confirmed if it has an RGB notification light? the G2 has a LED notification indicator.. im sure its the normal HTC R/G color. Thanks. The lack of one was one of the [many] things I disliked about the Vibrant. I watched pretty much ever HTC Desire Z video on youtube 2 days ago and saw one video where the LED was lit up green. I was actually very concerned about that too. I would hate turning the screen off and on to find out if I missed a call or text. SO worries should be put to rest there, I am certain I saw it. Why wouldn’t it have the multicolor LED like the G1? Because I’m way overtired which makes me a bit paranoid? I need this phone in my life…..My G1 has served me well, but there is only so much cyanogen can do for it anymore. CyanogenMod 6 is not playing nice. youtube and any other video player will not work. I can live with that flaw….not a life altering problem. I dont know if this helps. Im not much of a poster. Ok this may sound retarded but if anyone sees this do you happen to know if the release is Pacific Time? no luck so far, i’m on the G2 official site, and logged into t-mo’s site, and it’s still not available as of 12:10am…. T-Mo rep told me 21:30PST which is 12:30am EST. Really hoping that’s true. 10 more minutes! sure hope your right Surgio!! I’m going crazy over here!! The G2 is gone from the upgrade page where it used to be under the Vibrant in mytmobile. Maybe this is a sign? Here’s something else to think about when saying you intend to buy this phone. Remember when we discussed T-Mobile’s HSPA+ phones and I speculated that T-Mobile, like Sprint, might have special “4G” pricing attached to it, maybe $10 additional a month. Also, remember when AT&T came out with its new tiered pricing (that’s designed to make AT&T millions, if not billions, in extra profits because without a doubt customers will be going over their data plan limits). We discussed back then that it was only a matter of time before other carriers went to tiered pricing and also did away with unlimited data plans. For now, all of this makes T-Mobile more attractive with its “limited – unlimited” plans (recall the lawsuit because T-Mobile’s unlimited plan is actually limited) and that so far we have not heard that T-Mobile will have “special” HSPA+ phone pricing. But look what was in the Wall Street Journal today. Be afraid people, very afraid, that T-Mobile might go the way of AT&T, Verizon and Sprint (T-Mobile might also mimic Sprint and charge extra for its HSPA+ “4G” phones). Would your decision to buy this phone or other T-Mobile “4G” phone be affected if T-Mobile charges you more for the data plan on those phones? All of you saying you will buy this phone, have you thought about and factored in that the phone might be $10 additional per month? Verizon Communications Inc. Chief Executive Ivan Seidenberg said the company’s wireless arm expects to introduce its own form of tiered data pricing, possibly over the next four to six months. The wireless industry has struggled to balance the increasing demand for data capacity with unlimited plans that cap how much revenue carriers can generate from their subscribers. The dynamic has pressured the carriers, who need to pour billions of dollars into their networks to ensure that the traffic flows smoothly. Verizon CEO Ivan Seidenberg said the company’s wireless arm expects to introduce its own form of tiered data pricing, possibly over the next four to six months. Mr. Seidenberg said the introduction of new products and services—likely in conjunction with the launch of fourth-generation wireless services—would allow Verizon Wireless to introduce a tiered pricing structure. The carrier would follow AT&T, which earlier this year introduced a two-tiered data structure with caps on how much data can be used. But Mr. Seidenberg said the tiers and bundled offerings would be different. Nah, I’m not too worried. T-Mobile reps have said that the G2 will have very similar pricing as any of their other smart phones. This phone wouldn’t be any different. Why would it. The G2 will rock! Can’t wait to have it. I just checked my tmobile upgrade section and they took the cell down. just went off the store for me. something’s going down. if you search for g2 you can see the info on the phone, but nothing happens when you click on add to cart. Still off the site.. waiting…..
so that mean it wont be released until midnight pacific time in other words california time. Can you give us all an idea of what your at tonight? I am in New Mexico and the website has not changed for me any. Its looking like we’re going to be staying up til 330 in the Morn for this huh? @hissygoose well sorry I got excited refreshing my browser windows and fat fingered my post with misspellings LOL. no, no, the psych of thinking this was gonna work on time & with no hassles. your good. I’m in jersey too morning so i guess we wait until 3am or we go to sleep or order in the morning. Yeah they just told me it’s 6 am EST. I will do this in the morning. Going to bed!!! If it’s not at 12 cst which is about 10 mins. I’m turning in for the night. Looks like 3 AM Is The Go Time. That’s how it always is with my experience, CC opens at 6:00 am ADT. (East Coast). So for us on the Pacific side, if one is willing to get up or stay up (as I am) that means 3:00 am (and we get a jump on people who say they are not sticking around until 3 am to get a phone. LOL. Its now saying the systems are unavailable this is starting to be a headache…..
I’m chiming in late, but the systems go down when they have to make changes. So this is a good thing, it indicates pre-order is coming up. $199.99 with a $50 MIR. More like $264 after $50 MIR, at least for my area. My taxes/fees are $5 lower than Ryan’s… which are still definitely more fees than taxes only to have them tack on another $18 fee. And of course you gotta pay for shipping. I like T-Mobile, but not this much. To me, that price is not worth a contract extension, no way. Time to shop around, methinks. It’s available in My T-Mobile. $250-$50 MIR. Hey just for reference what’s your location? Just ordered mine! im in brooklyn, ny! What is the site to pre order the link Tmobile sent out is just the registration page? Hey man, are you able to do the status check of your order? I’m also an employee, and mine won’t pull up. Your order’s estimated delivery date: 9/30/2010. So why the heck did we “sign up” on that G2 site anyway? well i can get to the pre-order now page but its not showing up in the my.t-mobile.com phone list after i log in. Ordered. Hopefully I will get it early like I did with the G1. I leave for Vegas on Oct 3rd for my wedding! I don’t see the phone there. Now mine says estimated delivery date 9/27/10! I can get it to go thru online and Customer Care says it is out of stock right now…anybody else having issues with calling in? If they sold out already I’ll be a sad boy. Just placed my order but stupid me I forgot to write down my order number so I am unable to track it doh! That got-dang-it order site and tmobile.com is messing with my emotions!! I ordered it..or at least I thought I did! I put my credit information and everything in. Agreed to the Terms and Services and hit submit! It seemed like everything went through..but I wasnt sure and I never got a screen with an order number. I called Tmobile and they said that they dont know whats going on. I guess I’ll just try again later. Just ordered it! Ha Haaaaa…. I spoke with customer care because it is not showing on the website…. Really???? Did you order it through customer care or the website?? One of this pitfalls of the Nexus One is the touchscreen and sensor used. I won’t buy another device with the same. I wonder if the G2 is using the new ATMEL technology like the Galaxy S and Evo, etc.? If not, I will not keep it. After dealing with touchscreen issues on the N1, I am happy to wait for the right device. I believe HTC is using this in their new devices now, BUT, I would like this confirmed for the G2.